In our third installment about the making of the OneOak throne, designer-maker Robert Ingham talks about his creation. This chair is a combination of design, construction and expression. The design addresses the issues of function which is explicit in the word ‘chair’. It has to be able to support the weight and movement of the person who is going to sit in it in comfort. The construction, which is the challenge of putting together the complex components is achieved with the knowledge of years of experience of craftsmanship, and which draws on the tools and processes of the past and the versatility of the progress that has been made in the last fifty years with the introduction of machines that allow the craftsman to remove material to achieve the forms, shapes and practical junctions between components without taking away the hands on and lateral thinking of the craft. The expression is the visual factor that encourages the eye to engage with the chair and is the result of the designers’ desire to incorporate forms that have inspired them through the myriad of sensations that they have experienced from nature, architecture, drama, music, in fact all the fantastic sensations that the human mind engages. 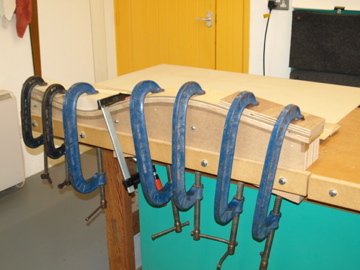 Laminating the curved uprights using a single part mould to hold the 4mm thick laminations in place with cramps while the glue sets. Epoxy resin is the glue was used as it does not contain water and cures chemically resulting in a very strong and stable bond. 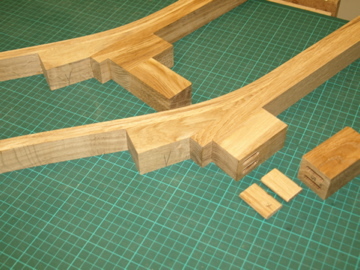 Splines (loose tenons) used to join the horizontal projections that will support the seat and provide a structural link to the upright legs and curved rails. 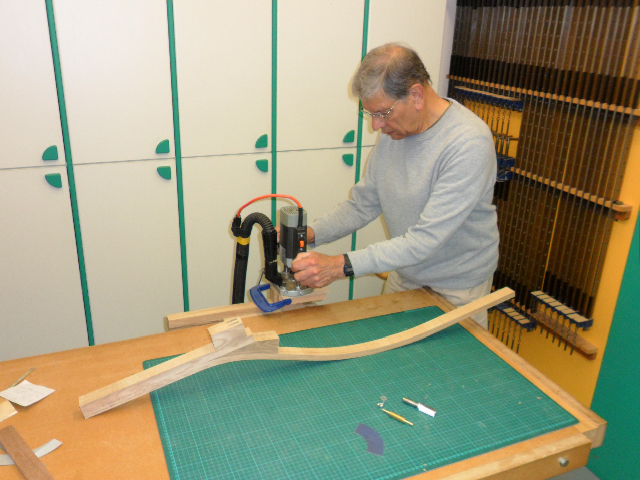 Shaping the flowing curve between the horizontal projections and the curved uprights. 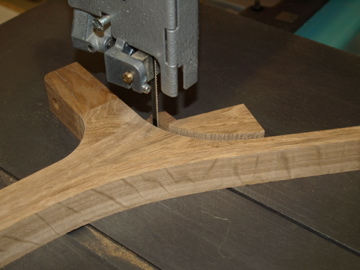 Removing the bulk of the waste with a bandsaw. 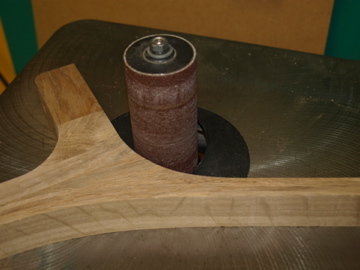 Finishing the curve with a bobbin sander. 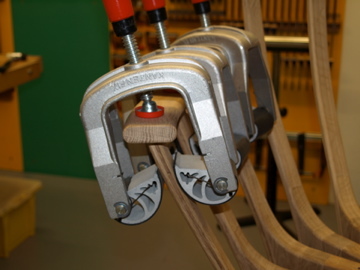 Gluing the arms to the uprights with cam clamps. 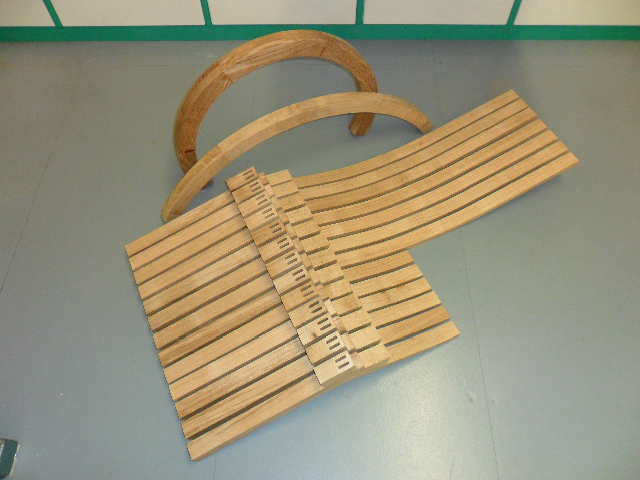 Without the tools and technology, this chair would have been a nightmare to make. In fact, I would go as far as to say, impossible to make. The chair is my manifestation of the open minded attitude that technical progress has made available to the craftsmanship of today. 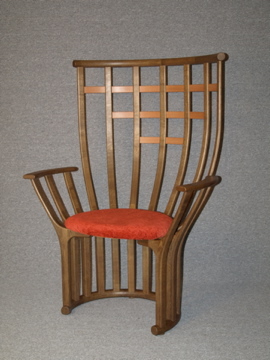 Designer-maker Robert Ingham has shared with us more photos of his work in creating the OneOak throne chair. Another of Britain’s leading designer makers, Robert Ingham, has started work on a piece of furniture using wood from the OneOak tree. 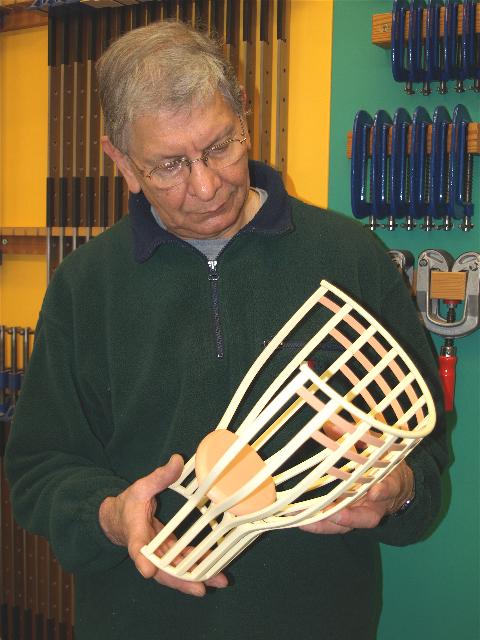 Robert Ingham, based in Denbighshire, is creating a piece called ‘Throne’. 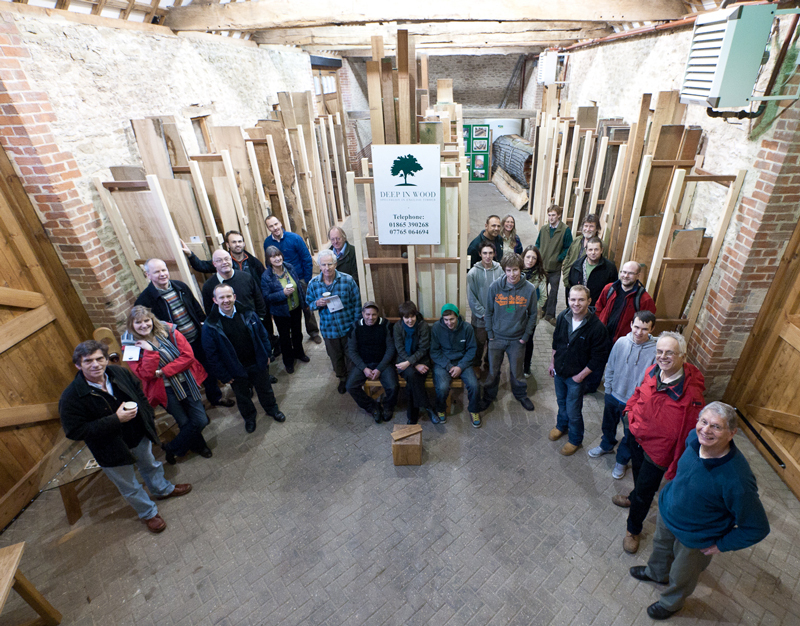 Like all the OneOak pieces, we will be following the story of its creation over the next few months on this blog. Robert will be joining us at our OneOak exhibition at Art in Action in July (read more).